Scenario paintball is much more fun when your paintball equipment is as realistic as possible. 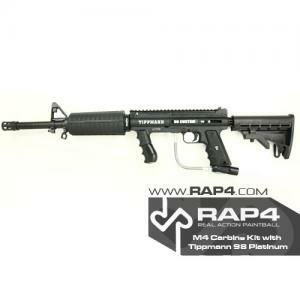 That's why the Tippmann 98 M4 Carbine marker is a great buy. This gun makes a great addition to any collection of gear whether you're an advanced player or a beginner. 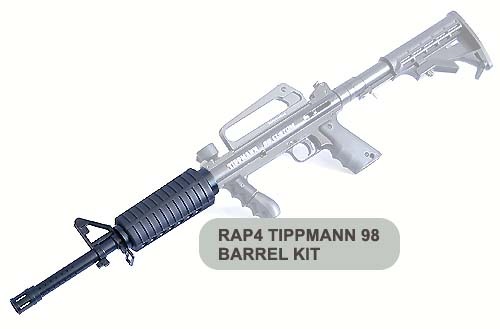 You will easily rule any paintball field with the most classic Tippmann 98 Custom package you can find. The Tippmann 98 M4 Carbine paintball marker has an excellently realistic weight and feel to it; you will delight in the slight kick you feel with each trigger pull - this gun has power! You'll be carrying this replica rifle into battle for a long time, as this M4 Carbine paintball gun is built on the reliable Tippmann 98 Custom Platinum Series marker. The Tippmann 98 features an aluminum receiver and molded foregrip for an excellent stable shot. The 98 Custom PS is easy to clean, maintain and is accurate and ready to fire right out of the box! The carbine buttstock and M4 handguard give the Tippmann 98 an authentic carbine look and feel. 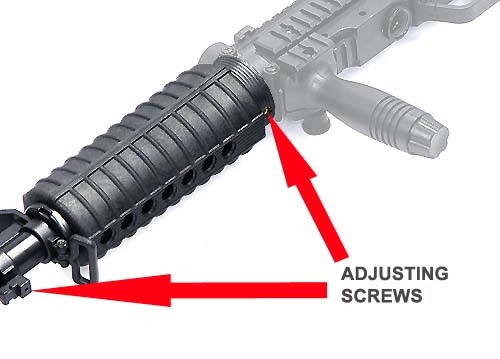 The tactical barrel kit included with the Tippmann 98 Platinum Series M4 Carbine package features a 16" barrel; making this marker a good match for close, medium and moderately long range shooting. You can also choose to customize your 98 Custom! This marker package comes with the Tippmann 98 Custom Platinum Series (without ACT); choose from the options below if you want to upgrade to the version with ACT or an upgraded trigger system. Response and electronic triggers with fully auto options are also available. Buy the Tippmann 98 Custom Platinum Series M4 Carbine Package from Choicepaintballguns for the best deal you will find on the internet. We promise to process your order immediately so you will get your marker as quickly as possible. Our website is secure and safe to order all your paintball products online.